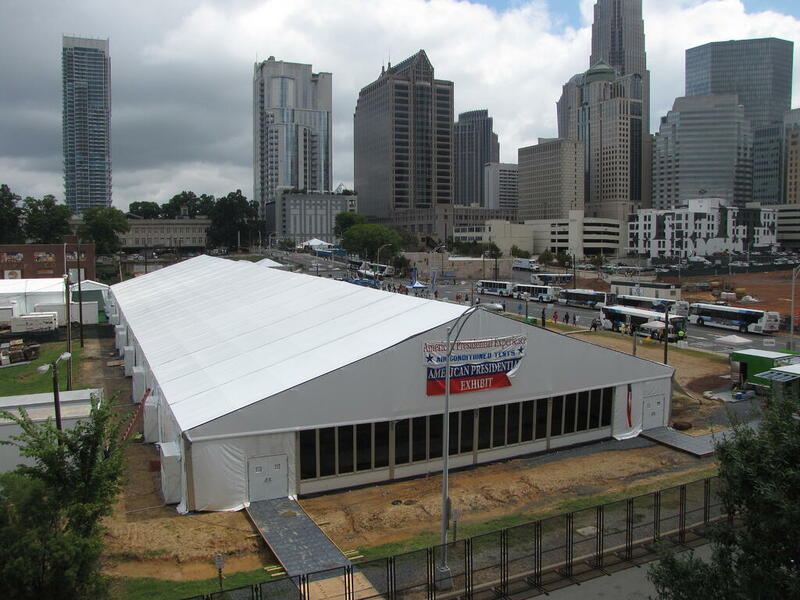 Mahaffey Fabric Structures, headquartered in Memphis, Tenn., installed a 100' x 282' clearspan structure to cover the American Presidential Experience exhibit at the Democratic National Convention (DNC), located in Charlotte, North Carolina. American Presidential Experience is a traveling, public display which has been showcased at both Republican and Democratic National Conventions. This year’s Experience includes replicas of the Oval Office, Harry Truman’s limousine, presidential chairs, First Ladies’ gowns, and other Presidential artifacts. Several other structures were provided by Mahaffey, including a catering tent, dining tent and a storage area, comprising over 30,000 square feet of space. The structures are equipped with various amenities including lighting systems, pipe and drape, red and blue carpet, all in true patriotism. Mahaffey is also providing restroom trailers for the exhibit. “Mahaffey is excited to partner with the American Presidential Experience for the 2012 DNC," said Terry Logan, Mahaffey’s National Sales Manager. “They have done a phenomenal job of preserving and presenting the heritage and history of the American Presidential position. Mahaffey is honored to be a part of our American history." Mahaffey’s involvement in political events is extensive. We have provided mobile broadcast studios for FOX News and other major broadcast networks during the 2008 Republican National Convention and Democratic National Convention as well as during President Obama’s Inauguration in 2009. Want to speak to a specialist today about Mahaffey's structure solutions for event spaces? If so, click the button below to get the planning started. We look forward to hearing from you!